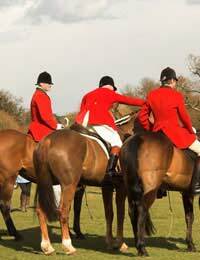 Hunting often conjures up images of horse riders dressed in red jackets (known as redcoats). This may be true but it’s only one part of traditional fox hunting clothing. Read on for more information on traditional hunting clothing and equipment. Hard bowler hats are traditionally the standard form of headwear for hunters, but they are no longer particularly significant on modern hunts. Many hunters now wear safety caps or helmets instead. The usual colours of these are navy and black, but it’s become more acceptable for many female members of the hunt to wear dark blue (not necessarily navy) hats. These can give a smart appearance. Traditional black hunting caps are usually worn by hunt masters, field masters, and hunt staff. This is probably the one item of clothing that most people associate with fox hunting. The huntsmen, masters, whippers-in and officials all had to wear the distinctive red jacket for many years. This was often known as a 'pink' (so-called because that was thought to be the name of the tailor who originally designed the jackets).This has made been optional since the 2005 ban on hunting with dogs. Hunt masters may choose for the senior members of the hunt to wear the red jackets, but they aren't obliged to do so. Spurs are preferred, but they aren't obligatory. Boots must be black, and look presentable (that is, they’re not dirty and unpolished). Black garter straps below the knee are also preferred. Coats and jackets must be buttoned at all times, but the bottom buttons of waistcoats can be left unbuttoned if desired. Coats and jackets should be free from additional decorations and embellishments. The main exceptions for this are red poppies to commemorate Remembrance Sunday or black mourning bands. Anything else is frowned upon. The vast majority of hunters carry a hunting whip on all hunts. They aren't necessarily used to cause any distress to the horses. Most of the time, they are used to help the riders to open and close gates, and keep them open for others to pass through. When fox hunting with hounds was still legal, they can also be held in front of horses to stop the hounds from coming too close to the horses (and scaring or distracting them as a result). For women, hair should be put in a plait or covered with a hairnet, unless their hair is particularly short. It is expected that male hunters will have sufficiently short hair anyway, so keeping it under control shouldn't pose a problem. A lot of traditional hunting equipment revolved around the hounds, but since they have been banned from hunts, this is obviously no longer needed. Redcoats and hard hats are probably what springs to mind for most us when we think of traditional hunting gear, but much of this is dying a death since the ban on hunting with dogs. Some hunts have chosen to move with the times, whilst countless others have remained defiant, insisting that they may have had to change the way that they hunt, but they won’t change the way that they dress.